THE GREAT DISRUPTION: IS IT REALLY ON? A lot of us have been hearing warnings of catastrophe for years and have hardened ourselves to it. Personally it takes little effort to ignore or dismiss most disaster predictions or to develop a deaf ear. After all one has to get on with living with all the regular day to day problems. 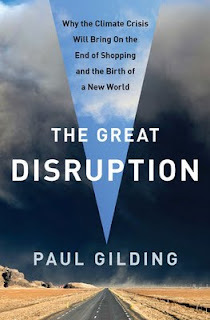 Paul Gilding is formerly a frustrated environmentalist that used to think if you could picture the impending disaster scarily, but accurately enough people would do something about it. He has now concluded that was delusional. However he draws parallels with World War II. Looking back in hindsight there were lots of indicators and warnings. Not much heed was given, but when the boiling point was reached there was a massive concerted effort to deal with it. The key for Gilding will be when environmental problems such as climate change come with serious economic costs, public opinion will shift dramatically. Like all predicted problems when they actually occur it is better to have some preparation. Gilding has plenty of advice, but tempers it with the realization that details are very hard to predict. At the bottom of the problem is our feeling that our economy must be continuously growing. If there are finite resources sooner or later you will run into problems unless you find a way to use existing resources in a sustainable way. After the 9/11 tragedy the advice from George W Bush was to "shop." The implication being that to get back to normal and not let the terrorists win, the most important thing was to resume shopping and let our economy keep growing. By our incessant emphasis on using up resources to keep the economy growing we are approaching a tipping point that points to a "Great Disruption." The solution involves a bunch of things you are already familiar with and that we have been told are too expensive and disruptive for our economy and way of life. Reduce carbon emissions as quickly as possible and turn to alternative sources of energy. This means a switch from oil and its support industries to something cleaner with a lot of very difficult adjustments. It means cutting out as much as possible harmful practices that seem normal to-day. This process will not be completed for decades. All is not lost. With disruptions come opportunities to re-direct our activities. Paul explores a basic goal of mankind--happiness. Studies he refers to suggest that happiness for poor people can be increased by small increments in wealth, but as wealth continues to increase it no longer necessarily increases happiness and certainly not at the same pace as before. But we are conditioned to strive for more wealth. A big disruptive shift of circumstances will encourage an examination of what we value most. If we choose mankind can provide meaningful jobs and a higher purpose for everyone. Fun will still be part of our future. People can learn to work together for our overall happiness. 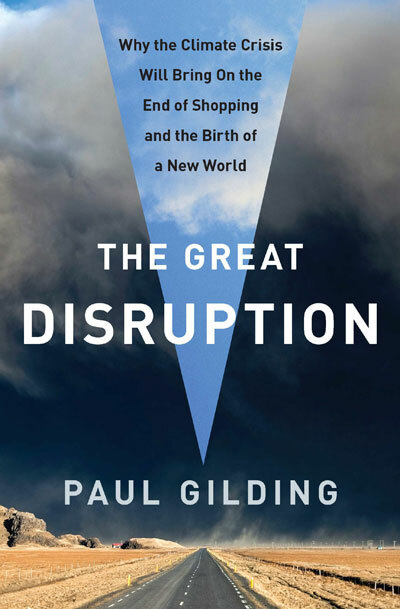 Nobody knows how things will work out, but it seems to me after reading this book (and many books picturing upcoming environmental problems) we are inevitably headed to some major changes, in fact a Great Disruption. Paul Gilding thinks we can turn things around. I wonder. Read the book. It is certainly thought provoking. A lot of money is applied to understanding the buyer. At some point many sales people despair of ever understanding the crazy, stupid and even sometimes seemingly vicious behavior of buyers. The prospects just don't understand the life changing opportunity they are being offered. A good place to start, is with your self. You have chosen selling as hopefully a good way to get enough money to help you be a buyer. Most of us love to spend money and are trying to figure out how to get more so we can spend more. A few of us are security conscious and can't get a big enough pile to protect us against that rainy day when we will need money to buy the necessities. Many of us are dipping into our credit and have planned expenditures for money we assume will come our way. Modern society has so many "new" things and some of us feel we have to keep on top of whatever is new. What is the problem? As some Wall Street analysts have figured out there are two main motives that fuel investors (and I would include consumers) which are Greed and Fear. They are both easy to identify with if you are really honest. Greed, is that insatiable desire to have more and better things (including experiences). We don't all want the same things for the same reasons, but we all want more. So why isn't that prospect like everybody else and buy the excellent value we are offering at some inconvenience to ourselves? Counterbalancing Greed is Fear. At some point everyone fears losing something. Often it is concrete goods, or something semi-concrete like money. For most of us a big fear is losing the good will or respect of people we love or fear. We know if we spend too much money on unimportant things we may not have enough for the really important things. If we share our goals with others we fear they might be upset with our mistakes. Young people are accused of spending their money on superficial things and not saving for the rainy day. But at some point they realize there is a limit to what they can spend. For some it goes beyond their cash and bank account to include credit in one form or another. To actually buy something we all go through stages. I will use an example I wrestle with. I am going about my business trying to make a living when I realize I am slightly hungry and I crave the taste of a chocolate bar and there are some just a few steps away. Mind you, I only have so much change in my pocket and I have struggled about my need for a big financial plan so I can get a newer car or go on vacation. Do they have my favorite? If they don't I might be able to resist a little bit. Did the weigh scale scare me a little? It is only this once. If the lineup is not too long and my time is relatively free. Sooner or later I give in and gobble it down before I have time to regret my decision. Then I reflect on it--tasted good, feel a bit fuller and more energetic. Probably gained some weight and don't have any money for a newspaper or parking meter. Better to be more discriminatory and focused on finances. So there are some positives and negatives as other priorities are weighed. We are all hit with the messages. As a salesman I hit people with messages and I hope my superiors are spending money on advertising with the latest technology and psychology to deliver reinforcing messages. We all, and I mean you as well are very resistant to most of the messages. We have to be--we couldn't give in to all the pleas or we would be in debt well over our heads. We know if we are to get more of what we really want we have to hold onto as much money or credit as we can. On top of fear is the limits of time. You don't have time to even listen to all the buying opportunities. Be honest you want more time to do what you want to do and that doesn't allow a lot of time to listen to even more sales propositions. Do you trust sales people? Do you suspect hidden motives? Do you blame a sales person for a bad buying decision, but personally take credit for good decisions? Has a sales person ever let you down? How did you feel? Has a sales person ever exceeded your expectations? How did that feel? Before you try to analyze the motives of your prospects take a good look at your motives. They aren't all that different..